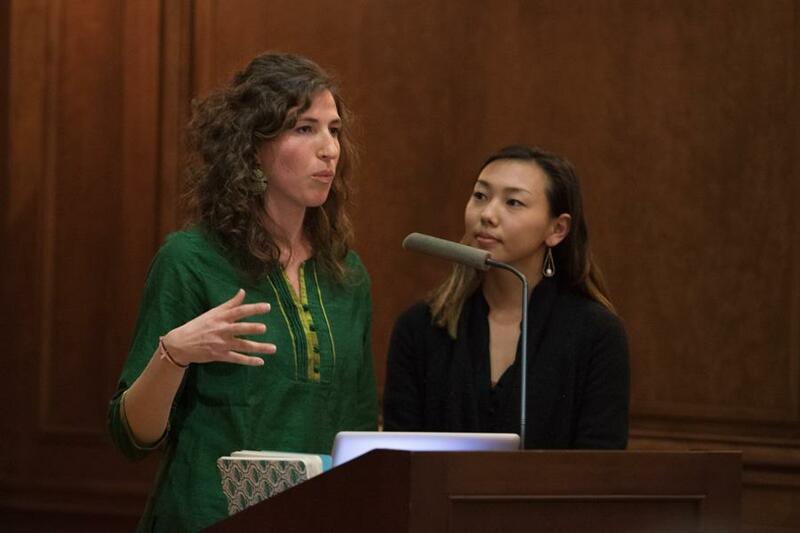 Leah Varjacques (Medill ‘15, left) and Katherine Nagasawa (Medill ‘15) talk about their documentary “Beyond the Seal” at Harris Hall on Tuesday. The documentary depicted banana farmers advocating for fair-trade practices that would better working conditions. The Buffett Institute for Global Studies hosted a screening Tuesday of “Beyond the Seal,” a web documentary created by two Northwestern alumni about small farmers fighting to change the banana industry through fair-trade practices. The project, created by Leah Varjacques (Medill ’15) and Katherine Nagasawa (Medill ’15), includes a mix of text and video depicting the struggle of fair-trade practices — which advocate for workers’ improved conditions — to compete against large corporations that set low prices and use cheap labor. “We decided to go down the supply chain to Ecuador to hear the voices of farmers and see how fair trade plays out on a daily basis in their lives,” Nagasawa said. About 70 people attended the event in Harris Hall organized by Patrick Eccles, associate director of Global Engagement Programs in the Buffett Institute, and co-sponsored by Northwestern University Community for Human Rights, Real Food at NU and Knight Lab. The event was part of the Human Rights Speaker Series, sponsored by the Buffett Institute. Varjacques and Nagasawa shared clips from their documentary showing the common experience of Ecuadorian banana farmers, who face low wages, poor working conditions and obstacles to unionize. The documentary also showed how fair-trade practices can improve these issues by providing more suitable working environments and steady, liveable incomes. “It also really fits into our efforts at the Buffett Institute to foster dialogue around critical global issues like this,” Eccles told The Daily. Weinberg junior Maria Fantozzi, co-director of NUCHR, said her organization wanted to sponsor the event because Varjacques started working on the project as a student when she was a member of the group. “We’re really excited to support an NUCHR alum and see what (Varjacques has) been working so hard on for such a long time,” she told The Daily. She also said fair trade connects well with issues NUCHR discussed during their January conference. “NUCHR’s topic for our 2016 conference was business and human rights and it focused quite a bit on corporate social responsibility, so obviously a documentary on fair trade bananas is very related,” she said. After the screening, experts who appeared in the documentary discussed issues that persist in the banana industry. The panel stressed that people often fail to consider the poor labor conditions that enable the sale of cheap bananas in grocery stores. Weinberg sophomore Ann Ho said the event left her curious about what solutions would best fix the complex issues within the banana industry. Ho said she admired the dedication the co-creators showed for an important topic. “I really respect two students going out and finding something that they’re passionate about and actually making a documentary about it that exposes a lot of the problems out there in something as everyday as bananas,” she said.